Earlier this weekend we looked at the incredible divergence in price between gold and gold mining companies and the potential opportunity it has created for investors today. See Gold Mining Shares Hated & Forgotten - Value Opportunity? 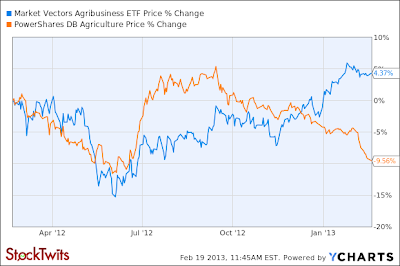 The following chart shows the same concept occurring in the agriculture sector, only in reverse. 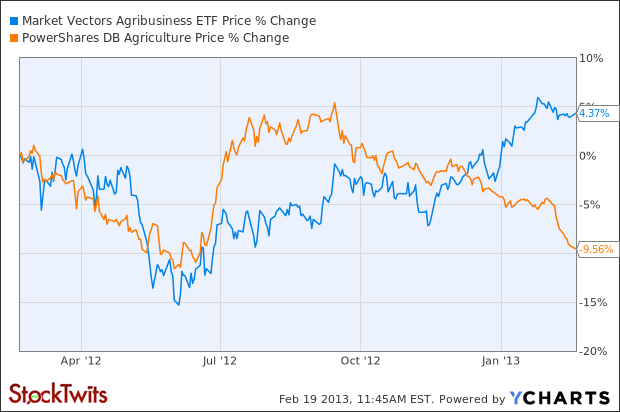 The price of the underlying commodity has sold off while the agribusiness stocks have surged. I am very bullish on the long term price of agriculture as a commodity during the decade ahead, while specific pockets of farmland and some stocks have currently reached levels of overvaluation. Agriculture has generally lagged most other commodities since they sold off heavily in 2008.